Posted by admin in activity reports, Alaska, Cleveland, United States. Alaska is not short of restless volcanoes, and Cleveland, on Chuginadak Island, is among the most restless, with frequent reports of thermal anomalies and ash emissions. In June and October 2009 there were small explosive eruptions, and this year in May-June and August-September there have been reports of occasional small ash emissions and thermal anomalies. On 26 August the Volcano Alert Level for Cleveland was raised to Advisory and the Aviation Colour Code was raised to Yellow, but the volcano was returned to Unassigned on 10 September following 10 days with no evidence of activity. Now, however, Cleveland is rumbling again and is back at Advisory/Yellow. On 12 September the Alaska Volcano Observatory reported satellite detection of thermal anomalies (11 September) and a possible ash plume (12 September): the estimated plume height was 25,000 feet a.s.l., which is more than 7.5 km. Accordingly the alert level was raised again on 12 September. The most recent Cleveland bulletin, issued on 13 September, reports that ‘Clouds obscure the volcano today and there are no reports of activity’. Reports of Cleveland’s activity usually come through satellite imagery (or direct observation) as there is no real-time seismic network at the volcano. Posted by admin in activity reports, Alaska, Batu Tara, Caribbean, Cleveland, Colombia, Dukono, Ecuador, Ekarma, eruptions, Galeras, Hawaii, Indonesia, Japan, Kamchatka, Karymsky, Kilauea, Kliuchevskoi, Manam, Nevado del Huila, Papua New Guinea, Reventador, Russia, Sakura-jima, Sangay, Shiveluch, Sinabung, Soufrière Hills, Suwanose-jima, United States, Weekly Volcanic Activity Reports. The Smithsonian Institution/United States Geological Survey Weekly Volcanic Activity Report for 25-31 August 2010 is now available on the Global Volcanism Program website. The following is a summary and not a substitute for the full report. New activity/unrest: Ekarma (Russia), Galeras (Colombia), Manam (Papua New Guinea), Sinabung (Indonesia). Ongoing activity: Batu Tara (Indonesia), Cleveland (Alaska, USA), Dukono (Indonesia), Karymsky (Russia), Kilauea (Hawaii USA), Kliuchevskoi (Russia), Nevado del Huila (Colombia), Reventador (Ecuador), Sakura-jima (Japan), Sangay (Ecuador), Shiveluch (Russia), Soufrière Hills (Montserrat), Suwanose-jima (Japan). Posted by admin in activity reports, Alaska, Batu Tara, Bezymianny, Cleveland, Dukono, Ecuador, eruptions, Eyjafjöll, Guatemala, Hawaii, Iceland, Indonesia, Japan, Kamchatka, Karymsky, Kilauea, Kliuchevskoi, Mexico, Pacaya, Papua New Guinea, Philippines, Popocatépetl, Russia, Sakura-jima, Santa María, Shiveluch, Taal, Tungurahua, Ulawun, United States, Weekly Volcanic Activity Reports. The Smithsonian Institution/United States Geological Survey Weekly Volcanic Activity Report for 2-8 June 2010 is now available on the Global Volcanism Program website. The following is a summary and not a substitute for the full report. New activity/unrest: Bezymianny (Russia), Cleveland (Alaska, USA), Pacaya (Guatemala), Taal (Philippines), Tiatia (Russia), Tungurahua (Ecuador), Ulawun (Papua New Guinea). 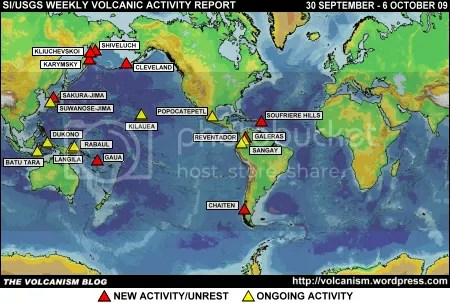 Ongoing activity: Batu Tara (Indonesia), Dukono (Indonesia), Eyjafjallajökull (Iceland), Karymsky (Russia), Kilauea (Hawaii, USA), Kliuchevskoi (Russia), Popocatépetl (Mexico), Sakura-jima (Japan), Santa María (Guatemala), Shiveluch (Russia). Posted by admin in activity reports, Alaska, Bezymianny, Caribbean, Chaitén, Chile, Cleveland, Ecuador, eruptions, Gaua, Hawaii, Indonesia, Japan, Kamchatka, Karymsky, Kilauea, Kliuchevskoi, Mayon, Pacific, Russia, Sakura-jima, San Cristóbal, Shiveluch, Soufrière Hills, Suwanose-jima, United States, Vanuatu, Weekly Volcanic Activity Reports. 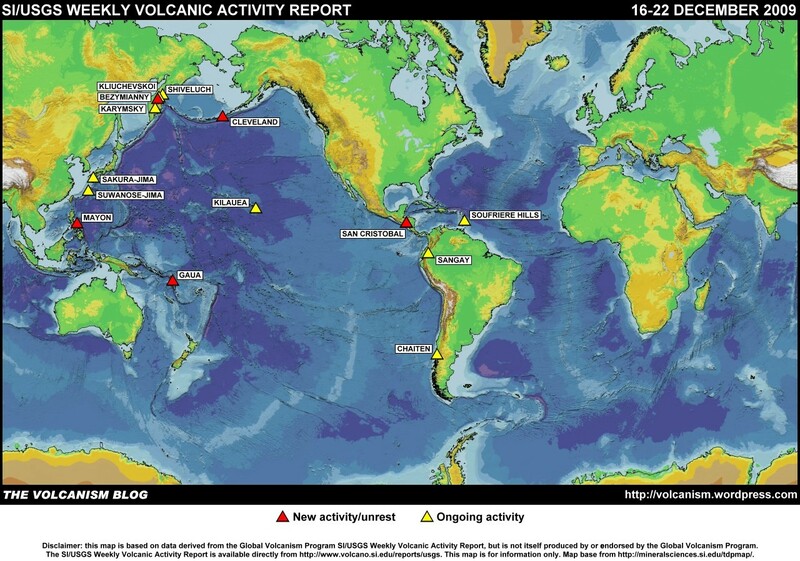 The Smithsonian Institution/United States Geological Survey Weekly Volcanic Activity Report for 16-22 December 2009 is available on the Global Volcanism Program website. The following is a summary and not a substitute for the full report. New activity/unrest: Bezymianny (Russia), Cleveland (Alaska, USA), Gaua (Vanuatu), Mayon (Philippines), San Cristóbal (Nicaragua). Ongoing activity: Chaitén (Chile), Karymsky (Russia), Kilauea (Hawaii, USA), Kliuchevskoi (Russia), Sakura-jima (Japan), Sangay (Ecuador), Shiveluch (Russia), Soufrière Hills (Montserrat), Suwanose-jima (Japan). Posted by admin in activity reports, Alaska, Bagana, Batu Tara, Caribbean, Chaitén, Chile, Cleveland, Colombia, Dukono, Ebeko, Ecuador, eruptions, Gaua, Hawaii, Indian Ocean, Indonesia, Japan, Kamchatka, Karymsky, Kilauea, Kizimen, Kliuchevskoi, Nevado del Huila, Pacific, Papua New Guinea, Piton de la Fournaise, Rabaul, Reventador, Russia, Sakura-jima, Shishaldin, Shiveluch, Soufrière Hills, United States, Vanuatu, Weekly Volcanic Activity Reports. 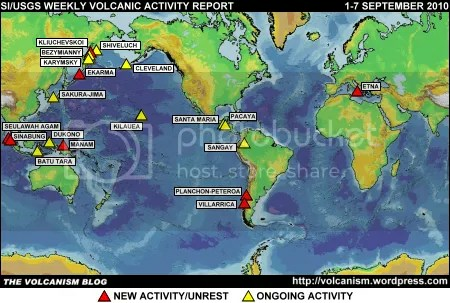 The Smithsonian Institution/United States Geological Survey Weekly Volcanic Activity Report for 14-20 October 2009 is available on the Global Volcanism Program website. The following is a summary and not a substitute for the full report. New activity/unrest: Chaitén (Chile), Ebeko (Russia), Gaua (Vanuatu), Kaba (Indonesia), Kizimen (Russia), Kliuchevskoi (Russia), Nevado del Huila (Colombia), Piton de la Fournaise (Réunion), Reventador (Ecuador), Soufrière Hills (Montserrat). Ongoing activity: Bagana (Papua New Guinea), Batu Tara (Indonesia), Cleveland (Alaska, USA), Dukono (Indonesia), Karymsky (Russia), Kilauea (Hawaii, USA), Rabaul (Papua New Guinea), Sakura-jima (Japan), Sangay (Ecuador), Shishaldin (Alaska, USA), Shiveluch (Russia). Posted by admin in activity reports, Alaska, Cleveland, Colombia, Galeras, United States. Following the recent bursts of activity at Alaska’s Cleveland volcano and Galeras volcano in Colombia, things have quietened down and the alert levels for both volcanoes have been reduced by their respective observatories. At Galeras, the INGEOMINAS Observatorio Vulcanológico y Sismológico de Pasto lowered the alert level to Yellow, ‘ Changes in the behaviour of the volcanic activity’, on 6 October. The level had already been lowered from Red to Orange on 1 October, following the eruption of 30 September. Meanwhile, the 2 October eruption of Cleveland volcano on the Aleutian island of Chuginadak caused the Alaska Volcano Observatory to raise the alert level to Orange/Watch. There has been no eruptive activity since that brief outburst, and the AVO lowered the alert level to Yellow/Advisory on 5 October. Posted by admin in activity reports, Alaska, Batu Tara, Caribbean, Chaitén, Chile, Cleveland, Colombia, Dukono, Ecuador, eruptions, Galeras, Gaua, Hawaii, Indonesia, Japan, Kamchatka, Karymsky, Kilauea, Kliuchevskoi, Mexico, Pacific, Papua New Guinea, Popocatépetl, Rabaul, Reventador, Russia, Sakura-jima, Sangay, Shiveluch, Soufrière Hills, Suwanose-jima, United States, Vanuatu, Weekly Volcanic Activity Reports. The Smithsonian Institution/United States Geological Survey Weekly Volcanic Activity Report for 30 September to 6 October 2009 is available on the Global Volcanism Program website. The following is a summary and not a substitute for the full report. New activity/unrest: Chaitén (Chile), Cleveland (Alaska, USA), Galeras (Colombia), Gaua (Vanuatu), Karymsky (Russia), Kliuchevskoi (Russia), Sakura-jima (Japan), Shiveluch (Russia), Soufrière Hills (Montserrat). Ongoing activity: Batu Tara (Indonesia), Dukono (Indonesia), Kilauea (Hawaii, USA), Langila (Papua New Guinea), Popocatépetl (México), Rabaul (Papua New Guinea), Reventador (Ecuador), Sangay (Ecuador), Suwanose-jima (Japan).